Disclaimer: In response to numerous emails, I personally wouldn’t classify Kali as a ‘demon.’ However, demonologist Collin de Plancy, who I cover extensively on this site, did back in his day. I tried to be fair and include descriptions from the Puranas/other Hindu literature to balance what he wrote, but I can’t change the fact that he included Kali in his list. If you’re still offended, you can read my response to angry emails I’ve received concerning this. Then Ambika became violently angry with her enemies, her face growing black as ink with rage. Suddenly there issued forth from between her eyebrows Kali, with protruding fangs, carrying a sword and a noose, with a mottled, skull-topped staff, adorned with a necklace of human skulls, covered with a tiger-skin, gruesome with shriveled flesh. Her mouth gaping wide, her lolling tongue terrifying, her eyes red and sunken, she filled the whole space with her howling. Seeing the sudden demise of the whole Daitya army, Canda rushed to attack that most horrendous goddess Kali. The great demon covered the terrible-eyed goddess with a shower of arrows while Munda hurled discuses by the thousands. Caught in her mouth, those weapons shone like myriad orbs of the sun entering the belly of the clouds. Then howling horribly, Kali laughed aloud malevolently, her maw gaping wide, her fangs glittering, awful to behold. Astride her huge lion, the goddess rushed against Canda; grabbing his head by the hair, she decapitated him with her sword. When he was Canda dead, Munda attacked, but she threw him too to the ground, stabbing him with her sword in rage. In Tantric mythology, Kali (coming from the feminine form of kala meaning “time,” “death,” and “black”) is often depicting standing on top of her partner, Shiva. She usually a third eye in the middle of her forehead and has four arms (though some depict her with more), a garland of fifty human skulls around her neck, and a girdle of human hands around her waist. The skulls represent the fundamental energies of the cosmos. The hands symbolize action and its karmic fruition. She is also usually holding a decapitated head in one of her left hands and a sword in another. 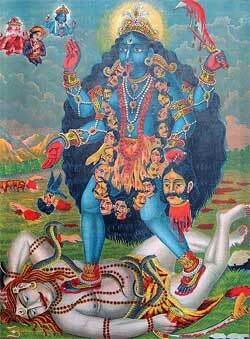 Devotees of Kali see her as a loving and protective mother. They call her Kali Ma and ask her for health, wealth, happiness, and liberation. As queen of the demons and sultana of the Indian hell, Cali is completely black and wears a collar of golden skulls. In older times, she was offered human victims.